There’s nothing like authentic risotto for sheer artistry. But at home I don’t seem to have the patience or inclination to constantly stir assorted liquids with rice in order to achieve the layers of flavor and creaminess it requires. Here’s an easy solution using orzo instead that takes all the work out of the process. 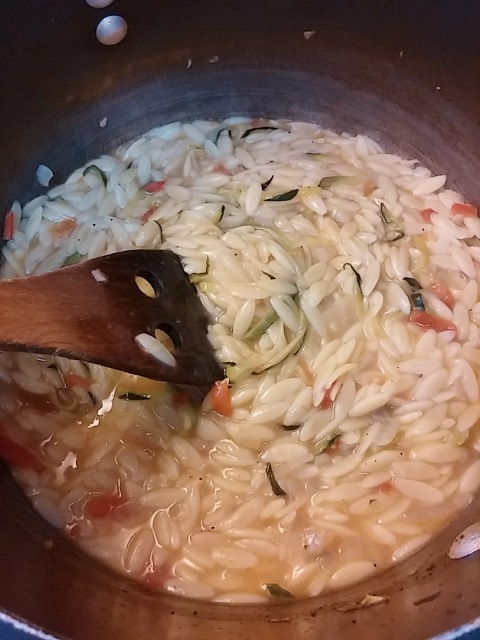 While the orzo and other goodies simmer away, diced zucchini can be stirred into the pot and cooked along with it. I discovered it was the ideal opportunity to whip out my new inexpensive spiralizer, which cranks out perfect spaghetti-like strands in the flick of a wrist. 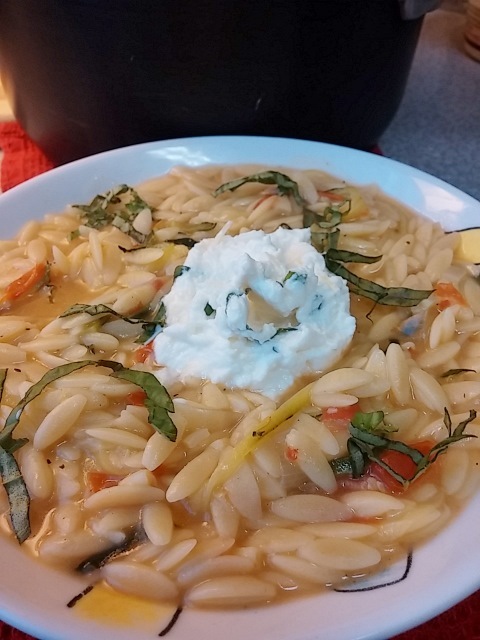 The zucchini sits atop the simmering orzo, and steams to an al dente state in no time at all. To finish: spoon into bowls and add a dollop of ricotta-basil cheese for extra creaminess. In 2-quart pot with lid, sauté the onion in olive oil to soften, adding the saffron in the process. Stir in the orzo and sauté for 1 minute. Stir in the broth, water, tomatoes, and bring to a boil. Cover, reduce heat and cook for 8 minutes. To finish with zucchini, scatter the strands on top of the orzo, sprinkle with salt and pepper and parmesan cheese, cover and cook about 3 minutes longer, until the orzo is just tender and zucchini is al dente. If liquid remains, increase heat, stirring until liquid evaporates and it is creamy.